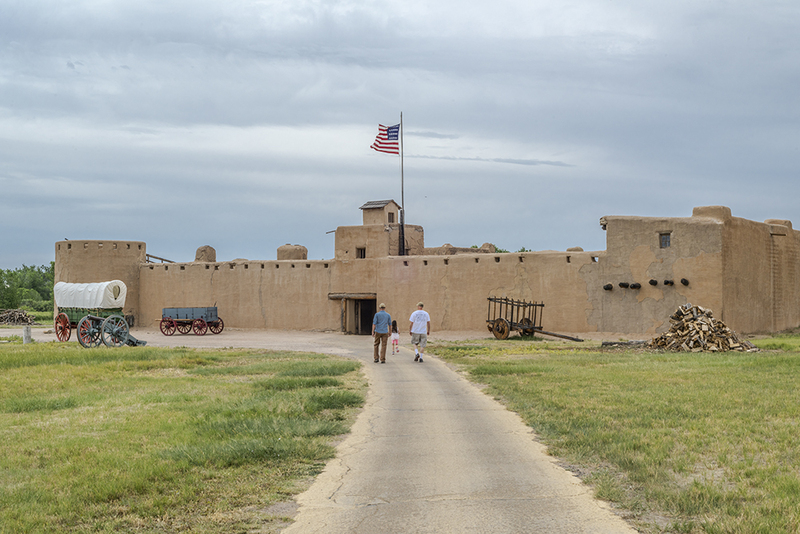 Our first scheduled stop was at Bent's Old Fort National Historic Site in southern Colorado. It's reconstructed from detailed measurements of a fur trading post from the 1840s. It was very well done, and made an impressive sight rising from the plains. Inside it was meticulously appointed in historic details, and outside oxen and horses and chickens roamed freely. There were some wonderful historic reenactors, like this fellow who was quite knowledgeable on the trading that took place among the settlers, the local Indian tribes, and folks traveling along the Santa Fe Trail. Jose was tending the fire and made W an egg burrito, with fresh eggs from the chickens that were roaming around. She is seasoning it with salt.